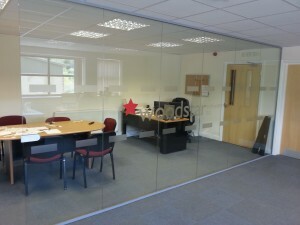 Your Frameless Glass Partitions Supplied & Fitted Without Fuss. We work directly with end users and as a sub-contractor. Below you can see a few examples of our projects, which range from forming small screens up to multiple offices and up! 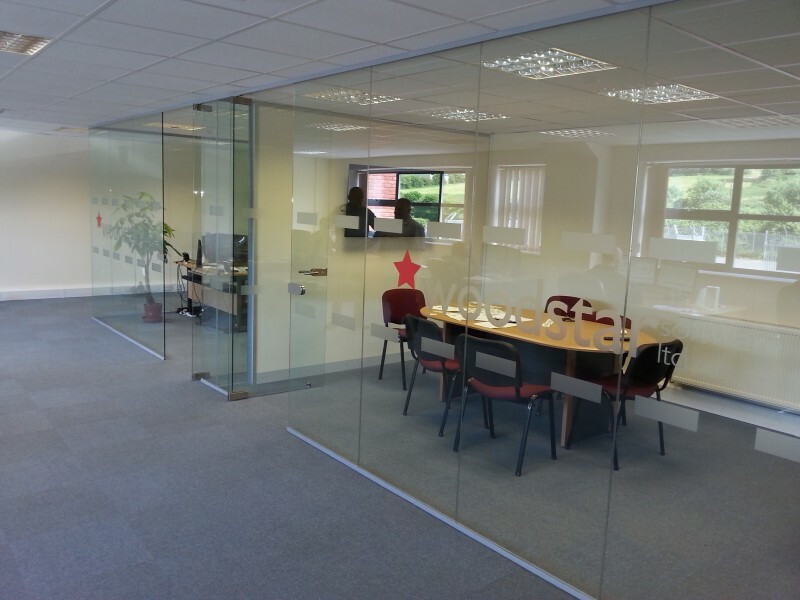 Create some light, airy and spacious offices with an installation of frameless partitioning. 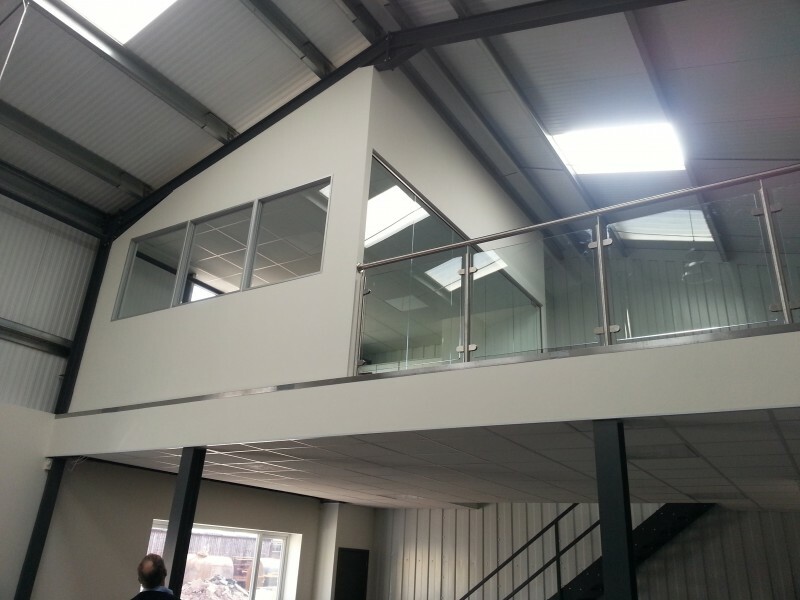 Enabling you to divide up your offices whilst still allowing natural light to flow through. This page covers the frameless glazing system, there are also glazed office partitions available if budget is of primary concern or if you’re not looking for the full frameless effect. We cover the area around Herefordshire and the West Midlands. A map showing our approximate travelling distance can be found here but please contact us if you are near this area and we will happily let you know if we cover your area. 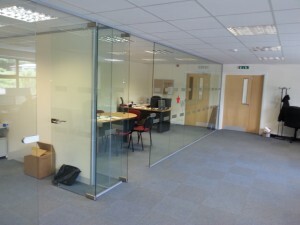 Frameless glazed partition in a stud partition opening. This partition was installed into an existing stud partition for Jaga Heating in Ledbury in their showroom to create a new meeting room for when their customers visit and to showcase a wide range of their samples. The manifestations took the form of a wave with their logo in the top corner. Frameless is quick to install with the minimum of disruption to your business. Minimal sections involved during the installation help ensure a clean. The glass partitions are finished with manifestations across the face of the glass, these can be as simple as dots or squares or, an image can be used such as your company logo (these are required under building regulations to highlight the presence of the glass partition). Full height frameless forming two new offices. This installation was for an IT software company when they moved locations. 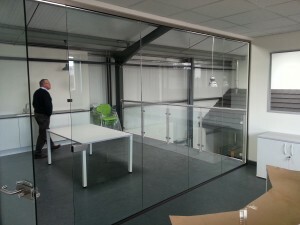 They wanted to create an office and a meeting room in their new premises. They had their logo incorporated into the manifestations on the glass. 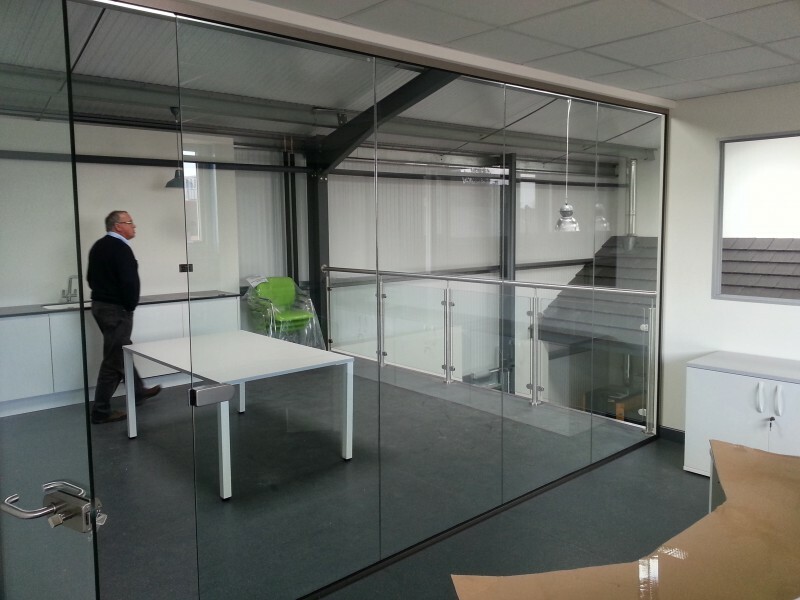 Depending upon the height of the partition either 10mm or 12mm toughened glass is used, with gasket around the perimeter securing the glass in place in the perimeter channel. It is available in both single and double glazed systems, with double glazed helping to provide a greater level of sound reduction between rooms or areas. Double glazed frameless can incorporate integral blinds with the use of slimline mullion posts. Profiles are available in a range of colours, with satin stainless steel furniture. 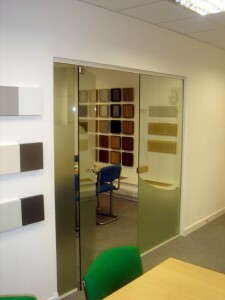 Frameless partition to a new showroom. 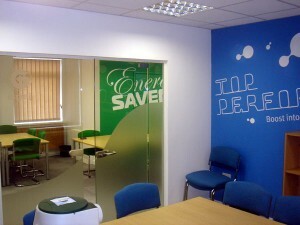 We carried out this project for the Efficient Energy Centre in their new showroom in Hereford. We formed the office on the mezzanine floor incorporating three windows and a run of frameless partitioning, we also fitted the stainless steel and glass handrail (and the suspended ceilings). These pictures were taken before the application of the manifestations to the glass. If you have any questions about the frameless glazing systems that we install please do get in touch with by clicking the button below. We can offer you a complete service if you require it, with one point of contact. 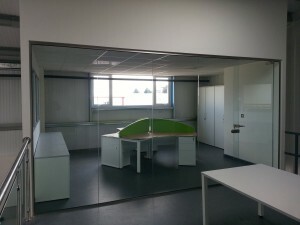 We cover a wide range of related interior works in relation to our frameless partitioning, including other styles of partitioning system, which we can look after and project manage for you if you would like us to. We would normally carry out any decorating works, ceiling or flooring alterations or installation, any electrical and mechanical requirements, or joinery works required for our customers; keeping everything under one umbrella, with one point of contact for them. 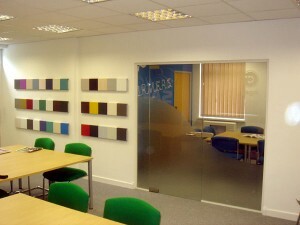 If you’d like to have a look our fit out services page it shows more about what we can offer you.